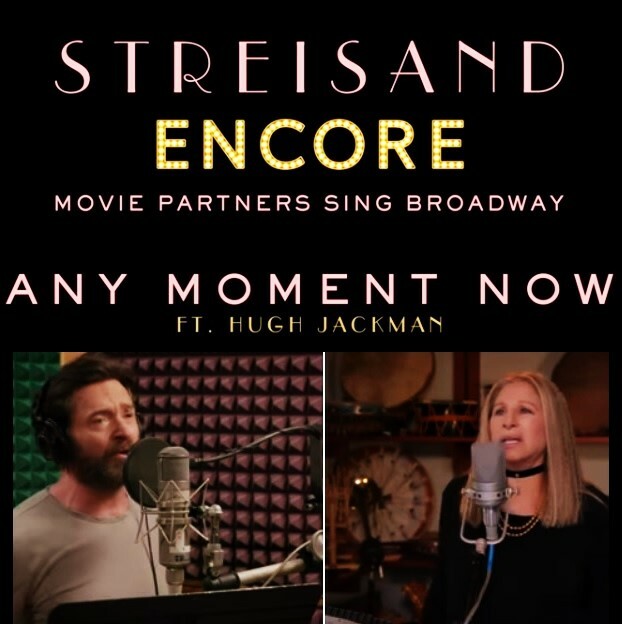 Stonewall Gazette: WATCH: Barbra Streisand & Hugh Jackman Sing Broadway Tune "Any Moment Now"
WATCH: Barbra Streisand & Hugh Jackman Sing Broadway Tune "Any Moment Now"
Fans of Barbra Streisand are eagerly awaiting the release of her new album, "ENCORE: Movie Partners Sing Broadway". This is Streisand's thirty-fifth studio album which will be available August 26, 2016. Hugh Jackman and Barbra Streisand sing a duet of the Marvin Hamlisch penned, "Any Moment Now" (from an unproduced version of "Smile"). Below, you can view the behind-the-scenes video of Streisand and Jackman recording the song, then listen to their magical pairing (audio only). Other featured performers on the album include: Anne Hathaway, Daisy Ridley, Patrick Wilson, Anthony Newley, Alec Baldwin, Melissa McCarthy, Seth MacFarlane, Antonio Banderas, Chris Pine and Jamie Fox.